The Nilan Colosseum, a grand amphitheatre constructed out of ashen-white stone, was situated halfway up a mountainside. It was built in the year 921 during the Era of Shared Governance and so featured the architectural style of that particular time period. This was represented in the delicate carvings covering the walls. It stood over 30 meters tall with more than several dozen layers, some parts having collapsed due to the passage of time. The interior resembled a labyrinth, with various rooms and corridors connected together. At the center was a large arena flanked on both sides by grandstands which could hold up to 50,000 people. This was a place where the wealthy squandered their money. The colosseum frequently hosted gladiatorial shows, earning the lion’s share of their revenue from patrons gambling on the fights. 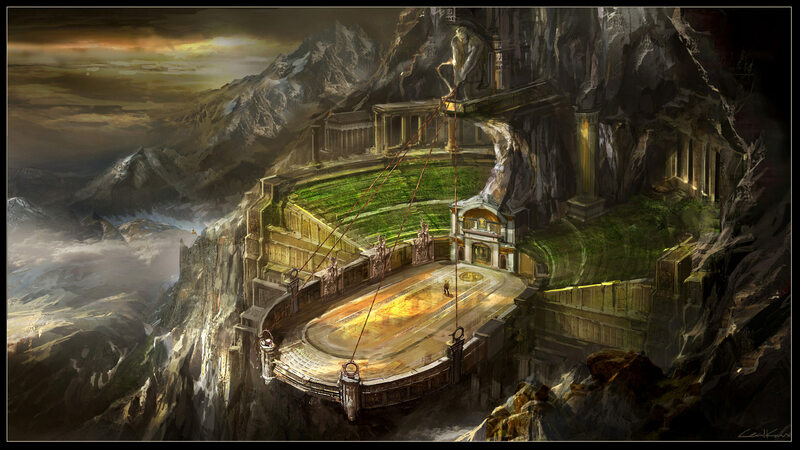 The Nilan Colosseum was taken over by a group of Evil Faction Thieves, who had to be defeated for everything to return to normal. Their leader was a Level 70 Variant Lord, an existence which at minimum required a massive expedition team of Level 70 players to deal with. Until then this place would stay under their control. There were Thieves cloaked in black garbs patrolling the public square up ahead. Their eyes glowed an ominous red as they sporadically popped in and out of stealth. Theses Thieves looked tough to deal with. Enemies that could stealth were always troublesome. Nie Yan activated Eye of Truth. Scanning his surroundings, he discovered a faint silhouette. Suddenly, he felt a strange heat flowing to his pupils as his eyes briefly flashed with a piercing red light. An observer would notice Nie Yan’s pupils had turned blood red! Nie Yan discovered everything seemed a lot clearer; he could make out the finer details of objects nearby, while the ones faraway no longer appeared as hazy. Another 18 silhouettes popped into sight. Out of the 20 something Thieves stealthed in the vicinity, not a single one could evade his eyes! It turned out the Thief he discovered before was only one of many. Nie Yan would’ve likely ended up in combat if he had rushed forward just now. These Evil Faction Thieves were Level 70 monsters. There was no way he stood a chance against them! Thankfully, Eye of Truth had ranked up! Eye of Truth couldn’t be improved solely with frequent use. It required actively uncovering opponents in stealth in and out of combat. This was to prevent players from grinding proficiency in a cheap manner. The system also had other restrictions in place regarding the target of the skill. Eye of Truth (Enhanced): See through an opponent’s disguise or stealth. Success is dependent on the level of the target. Cooldown: 120 seconds. Nie Yan would have an 80% chance of detecting an equal-level Thief through stealth with the enhanced version of Eye of Truth. His ability to see through a target’s disguise was also increased to 70%! The effectiveness of Eye of Truth greatly increased after ranking up, but there was still a high chance of failure against high level targets. Nie Yan was always worried about Eye of Truth’s effectiveness. Now his prayers were finally answered! Nie Yan guessed the Thieves he currently spotted with the enhanced version of Eye of Truth probably weren’t all of them. There might still be more that had escaped his detection. I need to rely on my other senses too, not just my sight! Nie Yan entered stealth and approached the colosseum. The Evil Faction Thieves were Level 70 monsters. They were powerful in combat, but their stealth detection abilities were very weak. This allowed Nie Yan to sneak past them using stealth. Nie Yan observed the movements of these Evil Faction Thieves for a while before figuring out a path forward and bypassing a group of them. He continued on and spotted several Thieves passing close to him. He could detect their bloody auras. After bypassing several more Thieves, Nie Yan suddenly sensed something approaching him from the left. He activated Shadow Waltz and dashed 7 meters forward. Nie Yan looked back to see an Evil Faction Thief pop out of stealth from his previous position and look around. It failed to discover anything and disappeared again. Breathing a sigh of relief, Nie Yan looked up ahead. He was only a hundred meters from the entrance to the colosseum, two dark and foreboding metal gates. Thankfully, it wasn’t guarded by any monsters. Not too far away was a Gold treasure chest tucked away in a corner. Nie Yan advanced another 50 meters, whereupon the number of Thieves in the vicinity lessened dramatically. After bypassing a small group of them, he arrived in front of the Gold chest without any problems. He bent down and started opening it. A while later, the chest popped open with a click. Nie Yan bent down and fished around before taking out a blue pearl. It was as big as his fist and ice-cold to the touch, resembling a large sapphire as it sparkled with a soft blue radiance. It was perfectly round and smooth, except for a small, pinky-sized hole at the top. Nie Yan appraised the pearl with Transcendent Insight. Mana Storage Jewel (2): The player can store mana inside this jewel, which can be used later on to cast magic. Capacity: 0/5,000 mana. Cooldown: 1 day. It’s a Mana Storage Jewel with a quality rating of 2! Not bad! Nie Yan thought in pleasant surprise. A Magic Storage Jewel was basically a refillable Mana Potion. And this one could store up to a whopping 5,000 mana! This was equivalent to an Advanced Mana Potion. Since it didn’t share a cooldown with Mana Potions, a Mage could use it at a crucial moment to save their life! At the later stages of the game, Magic Storage Jewels became an essential item to Mages. Players with even a little bit of wealth would carry one. Magic Storage Jewels with a rating of 1 were fairly common while ones with a rating of 2 were rarer. Magic Storage Jewels could only be found starting in Level 70 maps. Such items still hadn’t appeared in the marketplace. However, they would probably go for around 9,000 gold. Nie Yan thought for a moment. It was probably best to give the Magic Storage Jewel to a Priest. Young Seven, Painted Muslin, Black Heaven, any one of them would do. It didn’t matter whom since they were all three contracted members. He would give the Magic Storage Jewel to them and let them decide by themselves. These three players had already become the top Priests in Asskickers United. No one else even came close. It was no surprise since they were Archbishops in the previous timeline. With a Magic Storage Jewel, they would have one more assurance during expeditions. I always find something nice every time I explore new maps. Nie Yan tossed the Magic Storage Jewel into his bag, then continued making his way forward. When Nie Yan arrived in front of the entrance, he placed his hands on the metal gates and pushed with all his might. The metal gates finally gave way with a loud groan, allowing Nie Yan to step inside. The surroundings were dark, and he felt a cold draft blow in his face. In front of him was a winding corridor filled with entrances leading to other rooms on both sides. Nie Yan entered stealth and started exploring the corridor. He scanned around with Eye of Truth but didn’t discover any monsters roaming around. It was too dangerous to summon Lil’ Gold in a place like this. The corridor was decorated lavishly with a golden rug that stretched out far into the distance. There were crystal lamps on the walls, their flames rocking back and forth with the draft. All the doors connecting to the corridor were tightly shut. Nie Yan approached one of them and hesitated for a moment before pushing it open. Suddenly, a cold light flashed before Nie Yan as a dagger stabbed out toward his face. Nie Yan hurriedly activated Gale Step to avoid the attack and retreated several steps back. A cloaked figure emerged in front of him. It was an Evil Faction Thief! It wielded a sharp dagger in its hand, and there was a substance on the blade which flickered with a green light. Nie Yan’s heart trembled. The dagger was coated in poison! Humanoid creatures generally had low health pools. However, they were one of the most difficult monsters to deal with. Elite humanoid creatures often possessed rudimentary intelligence, making them far more dangerous than ordinary Elites. The Dusk Thief pounced toward Nie Yan, striking at his forehead with a Concussive Blow. Nie Yan sidestepped the attack. He retaliated with a Vital Strike, slashing the Dusk Thief’s neck as he brushed past and bolted away. Nie Yan wasn’t confident he could kill the Dusk Thief even if he used all his skills. Without any skills, he would be left extremely vulnerable. When the Dusk Thief was hit by Vital Strike, a damage value of more than 300 floated up above its head followed by a string of poison and bleed damage values ranging from 100–200. Nie Yan kited the Dusk Thief around the corridor, slowly whittling away its health with poison and bleed damage. Before long, the Dusk Thief fell to 2,000 health! Nie Yan paused for a split second, leading the Dusk Thief to instantly dash forth with dagger in hand. With Shadow Waltz, Nie Yan ducked around the Dusk Thief and then stabbed it in the back with a Lacerate and Eviscerate. Blood spurted into the air. After which he immediately ran, not daring to linger for even a second.